Kenya’s "University of the bush"
Academics from Kenya, Ethiopia and UK meet with pastoralists from Kenya and Ethiopia to document ways in which pastoral communities are insulating themselves from climate change. This model has given rise to a school christened ‘University of the Bush.’ Although there are no exams or assignments issued, the ‘University’ has made major breakthroughs in understanding the life and survival of some of the most neglected communities in Africa. 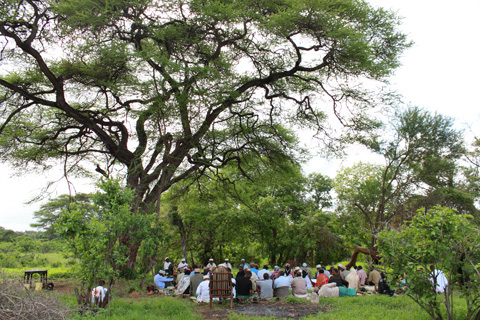 Far from the comfort of the city conference halls, the researchers meet the pastoralists under acacia trees where the pastoralists feel at ease to talk. The program’s name was chosen to give the pastoralists a sense of prestige as they participate. The University of the Bush itself has a faculty of some 50 members, including the researchers. It has particularly targeted pastoralists from Ethiopia and Kenya due to the close connections between the two through similar lifestyles and challenges. Taking place every three months, the university has given the pastoralists an opportunity to teach researchers some of their adaptations from health and fighting climate change since the pastoralists are locked out of health and climate change interventions. Some of the innovations shared by the pastoralists include special birthing kits for women, unique trenches used to harvest water and preserve it during dry spells and special inter community gatherings that find local solutions to local problems. “Welcome to today’s gathering. Today we will listen to and give our views on research on pastoralist innovation carried out in the past months. We open the forum with researchers presenting their finding for learning and your input. I will chair today’s session with Nura Dida from Oromia Pastoralists Association in Ethiopia,” says Molu Kulu, the chairman of Pastoralist Shade Initiative, the organizers of the University of the Bush when opening one of the training sessions. Pastoralists go beyond explaining adaptation to voicing issues affecting them like loss of their land, cattle rustling and peace. 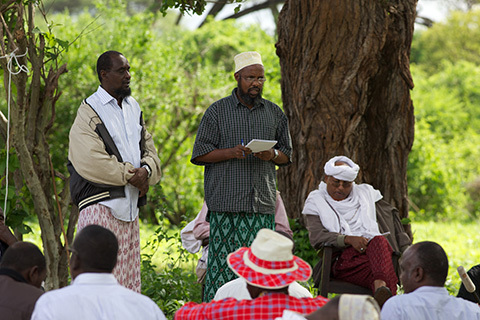 One of the issues that has traditionally escaped the attention of even the Kenyan media but has received attention at the University is the loss of pasture land in the Tana River area predominantly owned by pastoralists and which was taken to create room for the Bura Irrigation Scheme and part of which was used to settle landless families. “We have made these complaints for a long time. The loss of our land which we used to feed our livestock has had a huge impact on our lives and sources of livelihood. Yet we have never been able to explain how it has affected us. Land was taken away from us without enough consultation and everything was assumed to be okay,” said Ahmed Suni, one of the pastoralists at the University. According to the researchers involved in the programme, modern research methods and systems have not provided for the pastoralists and other marginalized communities to engage in its definition, analysis or its use, totally excluding them. The engagement with the pastoralists, the researchers say, has seen better research and better use of research, increasing the reach of scholarship and expanding the influence of new ideas. The researchers and scientists hope to promote the University of the Bush concept to areas where other pastoralists can be located which they say will help inform future research and investments in pastoralist-related activities. Already findings from the University which have been presented to the government have opened up several research projects that are assisting government in shaping policies that addresses the plight of pastoralist communities. Among key areas that have taken the government's interest is the contribution of the pastoralists’ livestock market to the Kenyan economy. This, after research that was inspired by the University’s initiative, found that more than 80 per cent of the beef consumed in Kenya is produced by pastoralists, either domestically or in neighbouring countries, and then imported on the hoof, often unofficially. The report dubbed ‘The contribution of Livestock to the Kenyan economy’ by Intergovernmental Authority on Development (IGAD) has seen the roll out of various abattoirs and organized meat markets in pastoralists areas by the government and companies.